Blame it on K-dramas. They’ve kept my heart fluttering—and my over-educated brain guessing—for thousands of hours. Or blame it on Ji Sung, still my fave K-drama star, who I will forever admire from afar. Or blame it on Korea itself, for making it so hard to buy laundry detergent. I don’t believe in writer’s block, but that’s the only way I can describe my massive, supernova-sized failure to write in the past few weeks. Writer’s block with a specific cause. Remember I said I was looking for teaching jobs in Korea? Well, the good news is that I found one. I just finished my first month working in Korea. I’m hearing Korean all day at work, hanging out with Korean teachers, eating ridiculous amounts of Korean food, and living in my very own one room apartment in a neighborhood full of coffee shops and chi-mek joints. The bad news is that I only had a few short weeks in February to pack up my life. And I started working here in South Korea as soon as the jet-lag wore off. For a few weeks, moving took up all my time. No time to post on K-Drama Today. Yet I haven’t started to write again. I haven’t even kept up with moderating comments. Aargh. What have I been doing? Mostly, I’ve wasted time wondering what to write about first. Visiting Korea for the first time is overwhelming—pleasantly so, I should add. I’m learning a ton of new things about Korean culture, things I didn’t learn from years of watching dramas and reading books. I have a lot to share with you. I also found time in the past few weeks to become deeply obsessed with Signal. This is the best kind of writer’s block, the kind where you don’t know where to start. There’s way too much to tell you all. But it’s still writer’s block. I need to get back to work. So I’m writing today to apologize. In the best Korean manner, I make my bow to you. I promise I will work hard and try to do better. Please forgive me. I will make time to write. I will update the plug-ins, check the broken links and moderate the comments. 1) Signal was magnificent. Why isn’t there a foreign category in the Emmys (the way the Oscars have a best foreign-language film) so Signal can get international recognition? 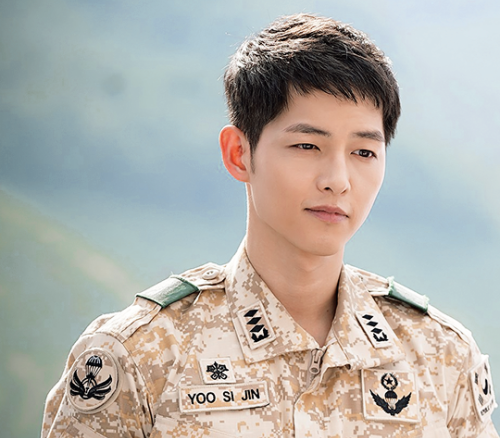 2) Descendents of the Sun has Song Joong-Ki in it. He’s very cute. Should I say more? The show’s popularity means that my Korean colleagues are all talking about it, making for good lunch conversation. Also, I think I have permanent hearing loss from the squees when I stuck a picture of Song Joong-Ki into a middle-school English lesson. Wow. Those girls are loud. The cause of squee-related hearing loss. 3) Korean laundry detergent looks exactly like Korean fabric softener, at least when they’re labeled in fancy, curvy Joseon-era hangeul fonts. I don’t even use fabric softener, but thanks to my failed attempts to buy laundry detergent, I now have an amazing fabric softener collection. But I will not give up! I will do laundry! Such are the things that take up too much time when you go abroad. And thanks to annoying stuff like that (I mean, thanks to these growth opportunities), I won’t be posting as often as I did in 2015. But I’m not giving up! Fighting! Wow! I was just clicking refresh on your site when I noticed that you had a new post up. Whootwhoot for going to SK and giving that book a fighting chance :). Glad to see that you’re in the thick of things and your experience so far has been awesome. Will keep on hanging for when you resume posting proper. Just wondering though, will you be putting up pictures and videos of your experiences? If not on the blog, somewhere we can see as well? I have this itching to live vicariously through you :). Because I wish I was in SK right now but I don’t have the funds to pull it off :(. P.S. If you do get to see Ji Sung, I don’t know, walking down the street, squeal enough for all of us, fangirl like crazy, demand an autograph and take tons of pictures :). I had given up on Kdramas till Descendents of the sun happened. I am enjoying it massively, cheesiness and plot holes be damned. Its an easy watch after a tiring day. Also came to know about Signal. Have saved it for a time when I’ll have time to marathon it. Ji Sung is coming back too, to dramaland. Good fun days ahead. Yaaay new post! I’ve missed your detailed insights into dramas. Wow, you’re in Korea! I remember you mentioning you were going, but I was surprised you meant this soon. I agree, the best writer’s block is when it’s only a game of which and not what (and then there’s time). SIGNALLLLLL! I loved it too and would love to read your thoughts. I’m rooting for you in the hunt for the elusive laundry detergent and will patiently await your return. I can’t believe that you write “chi-mek”, did you like it? Signal for me is like Korean movie, it feels like Korean mystery murder movie, south korean are good at it, really good, from the oldies OId Boy or Memories of murder. But me personally feels it’s so familiar, blamed it anime like Steins Gate, pshyco pass, NHK no youkosu and I watched Elementary while watching it. I just can’t shook this things out of my head every time I watched (sorry T.T). Signal should go for critic review cause I don’t think it’s for everyone. I had a chat with long friend who watched both Misaeng and Signal but didn’t finished it because they already predicted how it gonna be, ofc not the plot, but the overall tone and they just don’t feel like they need to go through that much curiosity, “ofc justice will prevail” said them. It baffle me on how differ the entertainment for every people and it reminds me on my own personal favorite-but-can’t-watch-alone series, Hannibal. I like it but I can’t stand my morality while watching it, and for them, they knew it’s gonna be truth vs corrupt people all over again and they feel enough with said 4-5 episode. I have to said the ending is . . . . Descendant of the sun to me is like detective procedural drama in western and Jdrama. The main thing is the romance but they have different problem each week that get solved each week too (I get this inspiration from a comment section). I like it, definitely enjoy it, but there’s something predictable although still satisfying. It’s not the best drama but I like it when I watch it, after that I just gonna look at the scenery and move on with my life. I don’t really mind on how real the procedure is because it based on Korean point of view and what needed in the drama since I don’t find drama is a good source to learn about a profession. it doesn’t end in cliffhanger each week which is why this is the best choice for my mom and my grandma, they just don’t speak Korean and reading is hard for them. DoTS may not a drama I will buy but every time it played on screen, I’ll watch it, it’s nice to see a good people (but I’ll buy the OST, with or without the drama relation). – not place to talk how DoTS flew in the safe side that enjoyed by lots of people without being great or get called shallow drama. Welcome back Odessa! Wow … you’re living and working in Korea now … that’s daebak! It’s great that Kdramas are providing you with good fodder for lunch conversations … I haven’t had as much luck. At my kids’ school, there’s a large South Korean community, and when I first started to geek out over Kdramas I’d look for any opportunity to show off my Kdrama creds with some of the Korean mommies, just to break the ice and get a conversation started, … but they would just giggle and nod and pretty soon I started to feel like the poor kid wearing a fake designer t-shirt in an elitist Kdrama high school drama. Then I met my friend Jee and it was fangirl-at-first-squee and epic bonding happened. Jee explained that what I mistook for condescension was actually the fact that many of the Korean mommies didn’t actually watch Kdramas, or they watched the long family dramas that I tended to veer away from … and also the fact that I was something of a novelty to them … pitching my “annyeonghaseyo”s at them like baseballs, when most of the other mothers tend to leave them to their little clique. I wonder if it’s hit-and-miss like that in Korea too, do you strike out a lot when you strike up a conversation about Kdramas? Good to have you back Odessa and good luck with the laundry! I have almost figured out the laundry, so some posting about Korean life soon! Hi Odessa, so glad to see you back. So you made it all the way to Korea like you said you wanted to. How about write a few things about how things roll in there that are different than the k-drama version because lord knows, when I get settled with my study plans for my post-grad, I do plan on visiting the land of The mighty Han river myself. I want to see the gorgeous cherry blossoms in spring in there if I can ever make it. I hope you’ll be recapping for the upcoming months because Ji Sung and HJE are both gonna be back and competing in the same slot. Also few more interesting stuff here and there. Anyway, good luck and stay safe. Ji Sung is back!!! The excitement of this hasn’t been lost on me. I hope to post about Korea soon! Congratulations on your new job and on your move to Korea! I know you will be warmly welcomed and appreciated by your coworkers, new friends, and your very lucky students. What grade or age level are you teaching? High school or college? Please let us know about your experiences, if it’s OK. I’ve always enjoyed reading blogs by native English speakers who are teaching English in the Korean schools and also followed the Youtube posts by exchange students, also. I thought the country was trying to reduce the number of non-native English teachers in recent years. How did I miss the huge changes in this site? Where in the world have I been lately? I am truly impressed — but not at all surprised at the increased breadth and depth of information and opinions here. Everything has changed so much! I remember being especially impressed with several articles from “Elements of Kdrama Style”, such as “Kisses, Man-tears” —and I referred to them often in the Soompi Forum I was following and posting in at the time for the drama, “I Had A Lover” —Aug. 2015 to Feb. 2016. And that 6 months is where I lost track, I believe! I so love your serious, intellectual, academic approach to Korean drama! Your serious approach is exactly what the dramas deserve. I look forward to the book you will write. And any trees involved in the final product will be well used! I see many ideas have been listed by the previous poster here already, so I will be trying to think of other ideas. For one thing, how can the kdrama fans outside of Korea make known their appreciation/opinions about dramas, actors, etc. For example, the “I Have A Lover” popularity phenomenon — NOT reflected by the in-Korea ratings systems — but acknowledged by the TV entertainment industry — How can the “fans” who watch via internet let the TV & Media people know what is liked ? Best wishes on your journey! Can you make a small space for simple journal-like updates? Like a “mini-weekly diary” maybe? Nothing too deep, just a few comments, observations, that sort of thing. Just reading your post one more time — clearly I overlooked the comment about the “middle school girls” loving the picture of Song Joong-Ki in the middle of a lesson! What a great age group to start working with in Korea! I want to recommend a blogger who write as here: [ imnopicasso. blogspot.com ]. This says that this is a “new” location of the blog. I see a section labelled “ARCHIVE” and was able to find a post from 2008. Not sure if you will find all the posts detailing her earliest career escapade . She always had an active approach to her role in the classroom and in the school’s teachers network. A force to be recognized! A serious, dedicated teacher — no “busy work” or meaningless “Worksheet” stuff for her students, “Open door Policy” and many hours with clubs and afterschool enrichment projects— structured and informal activities. She know her student personally and knows their strong & weak points. A very interesting woman with a distinct personal approach to teaching English in South Korea, An excellent teacher, respected by the students and her teacher colleagues. Comfortable in her living arrangements and in her place as a community member.I really like her. Lived & taught for 5 years. She find many commonalities between her own upbring in the the American south, her christian curch values & teachings and those traditional, Confucian, and very Korean ways of acting in the family, the classroom, etc. She is a tough as any Korean Ahjumma, in other word! A woman of strong, well reasoned ideas and belief — and very outspoken, direct, honest, fair, etc. Also, she has a dear boyfriend, named simply “B” in the blog, has visited with his family over holidays. Closer ties may be possible eventually. She has a fine list of Blogs & Links — very useful. PS: I think she is planning to move out of teaching — for lots of reasons explored in her past blogs — if most of them are still on her site. I hope they’re still available for you to read! She worked at a school in a southern, country setting. You may enjoy meeting each other. But her blog is so interesting to me! Thank you, sunbae! These are great links, and thanks too for the encouragement! The challenge is to keep making time to write, so every bit of encouragement helps. Great to see you back and great to see such wonderful, exciting news! Korea? Wow! Have lots of fun and if you feel that you have something to write about I’d love to read about your stay. My fellow commentors already asked many questions I’m interested in, too. Enjoy your stay! Nothing broadens one’s horizon like living in a foreign country. Odessa….how neat you get to live in the land of KDrama! Now that you’re actually experiencing, firsthand, the Korean culture….when you have time tell us all about your experiences….what you like and don’t like about Korea…..what is different from what we see in the dramas and what is the same. Someday, too, I’d love to have you give us some ideas of how to best translate Korean. I’ve studied it a little and can read and write it….but the translation has me screaming. One thing is, when someone is speaking in English and it is subtitled in Korean, I get my translator out and type in the Korean words. It never comes out in a way I can relate it to what has been translated into English on the screen. I know they don’t interpret word for word, but get the general idea across. I would love to at least understand how they think and speak their language….what form of ‘communication’ they speak in. I really don’t know how to describe what I’m getting at….but maybe you understand? So glad you’re back to communicate and ‘interpret’ for us again. You always seem to see things a little differently than I do. I’m going to begin watching Ji Sung’s new drama…Entertainer. Hope you’ll do that one! Enjoy your summer there! Good question about Korean! The two languages and their cultures are so different that it’s truly an art to subtitle between the two. I’m doing a lot of Korean study and I’ll try to write about it. And I’m watching the Entertainer with a big smile on my face, just because of Ji Sung!